In this seminar, we will discuss some concepts from political philosophy and performance theory, that can help us map the kinetic and aesthetic ideologies that inform the police flux of current day neo-liberalism. In parallel, we will reflect on some cases of performance art history where the inconsistent, the uncanny, the disparate, the vague, show possibilities for the accomplishment of another life. André Lepecki (Brazil, 1965) is Associate Professor at the Department of Performance Studies at New York University. He is also a curator, writer and dramaturg. Doctoral degree from NYU (2000). Author of Exhausting Dance: performance and politics of movement (Routledge 2006), currently translated into 6 languages. He edited the anthologies Of the Presence of the Body (Wesleyan 2004), The Senses in Performance (with Sally Banes, Routledge 2007), and Planes of Composition: Dance Theory and the Global (with Jenn Joy, Seagull Press 2010), and Dance (Whitechapel/MIT Press, 2012). He was the curator of the 2008 and 2009 editions of the performing arts festival IN TRANSIT also at Haus der Kulturen der Welt. 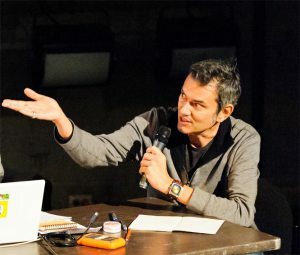 His co-curatorial and directorial work on the re-doing of Allan Kaprow’s 18 Happenings in 6 Parts (commissioned by Haus der Künst, Munich) received the International Art Critics Association Award for “Best Performance” (2008). In 2010 he co-curated with Stephanie Rosenthal the Archive on Dance and Visual Arts since the 1960s for the exhibition Move: choreographing you, for the Hayward Gallery, Southbank Center, London. He has given numerous talks in Europe, the US, Brazil, Australia, including at Brown University; the Gauss Seminars at Princeton University; Centre National de la Danse, Paris; Museo Reina Sofia, Madrid; Haus der Kulturen Der Welt, Berlin; MoMA; Centro Itaú Cultural, São Paulo; the University of Ghent; Roehampton University; Tate Modern; Freie Universität, Berlin, among many other academic and cultural venues.